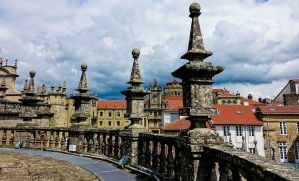 As the final destination for the Way of Saint James along the Camino de Santiago, as well as a historical site for many other reasons, this town receives a fair number of visitors. Hotels and hostels can be found around every corner, although many of them are quite expensive and small, especially in the old town. The hostels and hotels listed below are not only some of the best, but also the cheapest and most affordable in town. Some might be a little bit of a walk from the center and the main cathedral, but the values can't be beat. Each of the accommodation options listed here has a different atmosphere and vibe associated with it, so choose wisely before making your reservation. 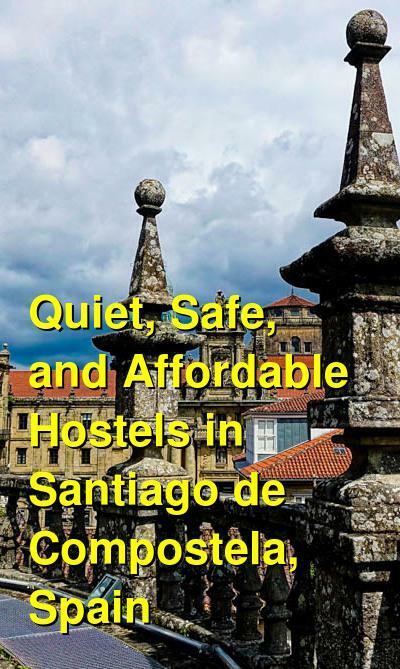 How much do hostels in Santiago de Compostela cost? This small, family run hostel is set in the owner's house. A few dorm rooms with shared bathrooms are available. The rooms and bunks are modern and bright, and the bunks have plugs, lights, shelves, and hooks. Modern facilities are also found in the bathrooms. Despite the small size, plenty of amenities are included. Usage of the communal kitchen is included, and the kitchen is bright, modern, and includes everything you could need for cooking your own meals. Free breakfast is included with your stay. The beautiful garden area is a nice spot to eat your meals, relax, or socialize with the other guests or the friendly owners. Free Wi-Fi is also included. The common areas are relaxing and comfortable. Many shops, restaurants, pubs, and more can be found in the surrounding neighborhoods, all within a few minutes' walk. The center of the old town area is only a few minutes away by public bus. Guests leaving reviews seem to love this place. The comfortable, homey atmosphere of the family-run hostel leaves a very good mark on many travelers. And they receive high marks for cleanliness, too! This large hostel set in the historic seminary building has a somewhat institutional feel. Basic dorms are provided in large rooms with large shared bathrooms (see photos). Private rooms are also available, and guests leaving reviews give these rooms very high ratings for the price. All bathrooms are shared and coed. Meals are served in the dining hall (for an extra cost) and a shared communal kitchen is available for those wishing to cook themselves. Not much else is offered. The atmosphere really can't help but be social due to the large numbers of beds in each dormitory, but the types of travelers staying here is very mixed and diverse. A mini-mart is on site for minor purchases, and there is a curfew. The location is outside of the city center, but not far. Hostel La Salle is located not far from the city center, and offers private rooms and dorms of varying sizes, both with and without ensuite bathrooms which are kept very clean and include towels and soap. Some of the facilities are a bit dated, but everything is clean and fairly modern. The shared kitchen is limited, but the common areas a great spot to socialize with fellow travelers. Free Wi-Fi is available. The staff can book tours or arrange for transportation. Nearby are some public parks and gardens, and a couple of museums. A bit longer walk will get you into the city center (or take the bus). Restaurants and shops are nearby as well. Guest reviews highlight the quiet atmosphere and the clean facilities. More of a Bed and Breakfast than a hostel, this very affordable establishment has a terrific location in the city center and is close to the train station. The prices are not too much higher than hostel dorms in some of the nearby competing hostels. The location is terrific, as it's just steps from everything in the old town including restaurants, shops, bars, museums, churches, and more. The atmosphere is relaxed, and the facilities are very clean and modern. This is a proper hotel with a good common area if you wish to socialize and play games or watch TV. A small cafe is on site, and they offer parking, free Wi-Fi, laundry, luggage storage, and 24 hour reception. Guests who have left reviews claim that the hotel is extremely comfortable, clean, and in a great location. The Acuario is a vibrant hostel with a fun vibe for hiking pilgrims or other travelers looking for an affordable place to sleep and mingle with other guests. Dorms are simple with brightly colored walls. Lockers are available, and the common areas are relaxing and nice. The spacious communal kitchen has everything you need to cook for yourself and more. The location is a bit far from the city center, but not bad if you take the bus. Guest reviews state that the staff is super-friendly and very welcoming.